Pudding and whipped topping—the perfect combination to make an easy, creamy pumpkin pie. Pour milk into large bowl. Add pudding mix and pumpkin pie spice. Beat with wire whisk for 1 minute (mixture will be very thick). Add in pumpkin with wire whisk; stir in whipped topping. Pour pumpkin mixture into pie crust. Refrigerate for 2 hours or until set. Garnish with additional whipped topping, if desired. 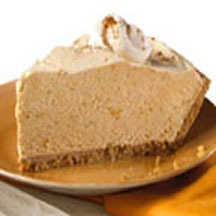 *May substitute 1/2 teaspoon ground cinnamon, 1/4 teaspoon ground ginger and 1/8 teaspoon ground cloves in place of pumpkin pie spice. Recipe and photograph courtesy of the KELLOGG® Company.